Author: Richard Mills. Series edited by: Gudrun Miehe, Brigitte Reineke, Manfred von Roncador. 23 pp. Roman, 1503 pp. 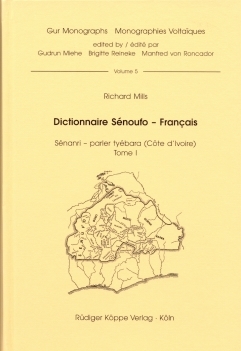 Senoufo is one of the four subfamilies of the Gur or Volta-Congo languages and belongs to the four most important language families of this region, together with Kru, Kwa und Mande. It is further structured into the five languages Minianka, Supyire, Senanri (with the dialects Nyafolo, Nafara, Tyebara and Nowolo), Senar und Tafire. Senanri is spoken within the vicinity of the villages Korhogo, Ferkéssédougou, Boundiali and Tingréla. The dialect used in the lexicon is Tyebara, which is the most important dialect of the south and functions as lingua franca of Korhogo. This can be explained by the precolonial background: this dialect has been the official language of the precolonial kingdom of the Tyebara. Furthermore, during colonial times it had – and still has – a big administrative influence on the whole region. Tyebara and the other Senanri dialects are intelligible. The lexicon consists of the following parts: Tyebara – French French – Tyebara and three appendices: 1. Faune et flore 2. Mois, semaines et périodes and 3. Chiffres, nombres et monnaies The book emerged in coherence with missionary occupations of the author during several longer stays at Korhogo and Abidjan between 1951 and 1999. The work under review is dedicated to the Senufo people who were able to preserve their cultural heritage. According to R. Mills, their intellectual vigour and moral values are well reflected in their language. Thanks to the missionary’s efforts and devotion all this was perpetuated and protected against a danger of the language death which is not seldom case in the African reality.